This entry was posted on 14-10-2009 at 11:33 am and is filed under boundaries, diachronies. You can follow any responses to this entry through the RSS 2.0 feed. You can leave a response, or trackback from your own site. We seem to have framed it well! We know what we are looking for, what we have at hand…..we think we know how to trap its freedom of expression…a site where people worshipped, were happy and content with their reality…hoping perhaps a bit more with the help of a humane God/s….were sad…were satisfying all their daily needs on the emotional and physical sphere….and yes, we think we can trap that reality and make it our own! We want today, yesterday and tomorrow!!! What a greed! 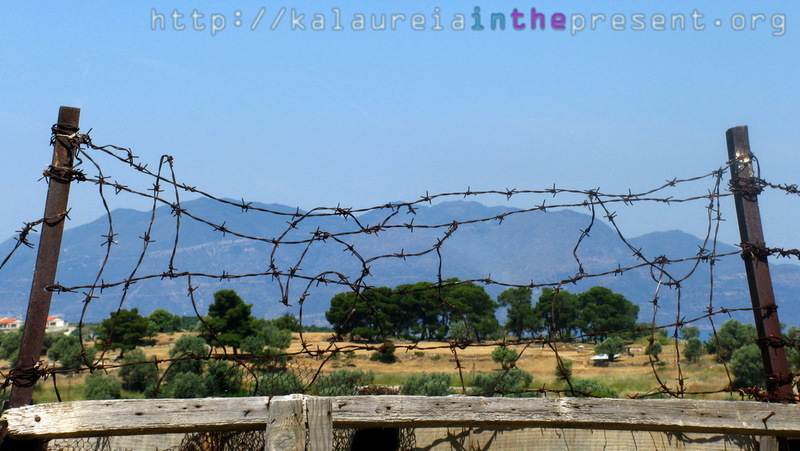 !…Then….we look again and see that we have only trapped ourselves and reading other realities through the barbed wire……This barbed wire is a boundary showing us that there is a limit to what we can achieve…and need to respect.